The patented human washing machine can be used by anyone. It can be used by the elderly or handicapped, who may prefer to shower naked by themselves, without the help of a nurse or other care provider. It can also be used by young, active people (for example sportsmen and bodybuilders), who from time to time may prefer a machine-assisted showering experience (for instance, due to sore muscles). The machine can be installed in hospitals, nursing homes, homes for elderly people, gyms, swimming pools and private houses, etc. 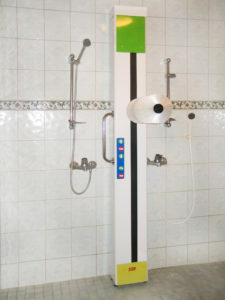 Installation is very straightforward, as all that is required is for the machine to be mounted next to a shower. Safety of use has been the of utmost importance in the development of the machine. The machine has also been designed for ease of use, with controls readily accessible by users. Push buttons to start the machine are located at front panel. There is a stop plate at the bottom, which can be pushed by hand or foot to stop the machine’s operations. For added safety, a timer in the control box stops the machine after every 10 minutes of use. The machine is CE-marked and built according to Machinery Directive 2006/42/EU. The included motors run on 24V DC safety voltage.